The question for us today, and I mean black and white, is can we actually achieve Indigenous self-determination while confined within a non-Indigenous ideological structure? Can we realistically expect those in power, influenced by common social conditioning, to make the philosophical leap across the chasm of bias? A chasm which as Eve Fesl points out in her book Conned, "regards Aboriginal people as dependants in need of control rather than as independent individuals who should decide their own destiny". Like Eve I have my doubts, because remarkably, considering that 210 years have passed since we first met, Australia has not willingly embarked as a nation, on the hard but necessary road to de-colonisation. Today we have a government hell bent on control of a situation of which they are truly fearful; the full emancipation of the Aboriginal people. 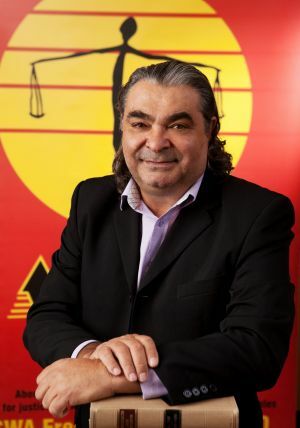 Dennis Eggington has a vision of social justice for Aboriginal people based on fundamental human rights and a 'fair go' for all. A Nyungar man, Dennis has served his people passionately for most of his life. As a pragmatic and esteemed leader, he is very often the voice of the Nyungar people. Dennis Eggington is an articulate man of great foresight and principle, he opposed the Northbridge curfew, supported Aboriginal land rights as the basis for enabling Indigenous Australians to live a good life and strongly opposed those who have sought to blame Aboriginal culture for domestic violence and child abuse in Indigenous communities. His call for a Human Rights Act, both in WA and nationally, is indicative of his unshakable moral standpoint.